1. Admetus and other poems by Emma Lazarus. Emma Lazarus (1849-1887) achieved lasting fame with her sonnet, "The New Colossus" written in 1883 as part of a fund-raising effort for the pedestal for the Statue of Liberty. In 1903, Lazarus's sonnet was inscribed on the Statue.It has become an icon in its own right and a symbol of the visions and ideals of the United States. Lazarus's writings other than "The New Colossus" have been relegated to undeserved obscurity. 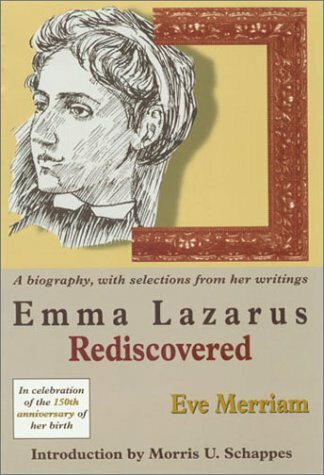 Eve Merriam's book, "Emma Lazarus Rediscovered" initially was published in 1956 under the title "Emma Lazarus: Woman with a Torch" and republished in 1999 to commemorate the 150th anniversary of Emma Lazarus's birth. 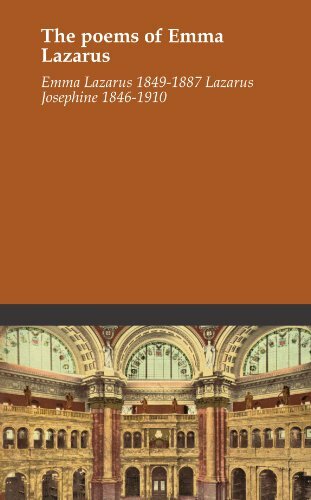 The new edition includes an introduction and conclusion by Morris Schappes, a noted Lazarus scholar, and sells for a bargain price.It is good to have this book available and accessible to encourage an exploration of the works of Emma Lazarus. Lazarus's life remains obscure and shrouded in legend.The definitive account of her life and achievement remains to be written. Lazarus was born into a wealthy and assmimilated family of American Jews whose ancestors had settled in the United States before the Revolutionary War.She received the best private education available and early showed an interest in poetry which her father encouraged.Her work was published while Lazarus was still in her teens.She met Emerson who also encouraged her and became something of a mentor.She never married.Contrary to the picture some have of Emma Lazarus as a recluse, she was highly social with many influential friends in the upper reaches of American society and government. She did show, however, great reluctance to speak or appear in public. Much of the enigman of Emma Lazarus concerns her attitude towards Judaism.She published some poems and essays on Jewish themes from an early age, but in the early 1880s. with the advent of the Pogroms in Russia, her Jewish writing intensified.She published a volume of poetry, "Songs of a Semite" which, as compared to her earlier somewhat conventional work, shows a writer with her own voice.She wrote lengthy essays on Jewish themes in many of the leading periodicals of the day attacking anti-Semitism and the Pogroms and praising Judaism for bringing ethical monotheism, and a love for truth, knowledge and justice to the world.Towards the end of her life, she studied Hebrew, but she never became a practicing Jew. Eve Merriam's study heavily emphasizes the Jewish aspect of Emma Lazarus and argues strongly for Lazarus's commitment to Judaism.Her biography is largely drawn from Lazarus's published works - her poems and essays -- and she sees these works as integral to understanding Lazarus.A great virtue of Merriam's study is the extensive quotations it gives from Lazarus's writings which for most readers will be unfamiliar and inaccessible.But her study is weak on documentation and pays too little attention to the record Lazarus's life separate from her published works. Following the initial publication of Merriam's book, a biography of Emma Lazarus appeared in 1995 by Bette Roth Young title "Emma Lazarus in her World. "I reviewed this book on this site some years ago. Young paid little attention to Lazarus's published writings.Instead, she studied closely other evidence, in particular the many letters that Lazarus wrote to friends. Ms. Young concluded that Emma Lazarus showed throughout her life an ambivalent attitude towards Judaism.She was never fully in it nor fully without it but admired it and tried to explain it to her friends in something of the manner of the outsider.Lazarus' milieu remained the world of culture and art of upper-society New York, with her Jewish interests resting somewhat uneasily and peripherally in this environment. Merriam's and Young's books compliment each other, but neither captures the full Emma Lazarus.Merriam's book comes closer for me in helping to understand her. Merriam emphasizes Emma Lazarus's love for the United States and sees her poem on the Statue of Liberty -- and other similar works as exemplifying a goal and an ideal for our Nation as a beacon for the world and as a source of human freedom and opportunity.She also shows, from her discussions of Emma Lazarus's writings, that Lazarus has much to contribute to modern discussions of American nationalism and of religious commitments.Lazarus became attracted to a form of Judaism emphasizing ethical behavior and universalism. She was distinctly uncomfortable with some of the rituals brought to the United States by the immigrants from the Pogroms and looked towards the development of a secularized, rationalistic, but still emotional religion. This is still a legitimate but elusive goal for many people. Lararus, as far as I can tell, does indeed display the ambivalences that Ms Young describes, but these ambivalences make her a vital figure rather than a somewhat marginal one as Ms. Young seems to assume. The value of Merriam's book is that it gives us Emma Lazarus in her own words and shows the reader that she is a writer who can teach and inspire.Emma Lazarus deserves a revival. With the exception of her sonnet, The New Colossus", which is inscribed on the Statue of Liberty, the work of Emma Lazarus is almost unknown today.In her short life, Lazarus produced an impressive body of poetry, translations, and plays.In particular she wrote poems on Jewish themes, on pogroms in Europe, and on an incipient Zionism.She is the first significant Jewish-American poet and is still, I believe, one of the most important. Ms Roth-Young's book is divided into two sections, the first consisting of a biography of Emma Lazarus the second consisting of a selection of her letters discovered and published for the first time by the author. Roth-Young has a knowledge of and affection for her subject. Roth-Young attacks views of Ms Lazarus that had been advaced by earlier writers, creating what she describes as a "myth".The "myth" sees Emma Lazarus as a reclusive spinster who discovered her Jewish roots in the early 1880 and changed from a late-Victorian poet with traditional late romantic themes to an ardent poet of Judaism. Because the work and life of Emma Lazarus are so little known, the critique of earlier writers appears overdone.A straightforward narrative might have been more effective.Roth-Young's portrait, and the letters, show, indeed a cosmopolitan, highly social Emma Lazarus who travelled twice to Europe in the final years of her life (1885-1887) and appeared more concerned with European culture and art than with recovering her Jewish past.It remains questionable, however, whether this is the whole story of a life or whether it is as inconsistent with earlier readings of Lazarus's life as Roth-Young believes it is. Lazarus described herself as a recluse; she was sensitive about her unmarried state. A large and varied correspondence does not rebut this self-perception.The book points to ambivalences in Lazarus's attitute towards Judaism, and this is useful in understanding her work. The book also could have used a fuller discussion of Emma azarus's poetry because, as Roth-Young is aware, it is virtually forgotten today. The forward to the book by Frances Klagsburn suggests that Emma Lazarus's poetry was largely conventional and derivative and that her Jewish poetry suffers from a certain lack of distance and personal involvement.There is not sufficient discussion of the poetry in the book to convince the reader that this is true.My own reading of this poetry is that it is a thoughtful and important predecessor of the liberal Judaism of our own day with much to teach us sbout the value of non-fundamentalist religion in a secular world.